With FocusNotes, you can divide the page in just three easy steps and conquer meetings, lectures and more. 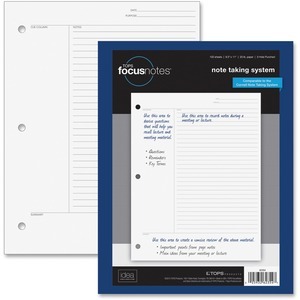 Comparable to the Cornell Note-taking System, this three-step method gets you focused with a cue column, ruled note-taking area and summary section on each sheet. Plus, note organization is easy with date and purpose fields at the top of each margin. FocusNotes filler paper is three-hole punched to fit in a standard three-ring binder for a totally customizable experience. Letter-size, loose-leaf sheets are made of premium white paper.